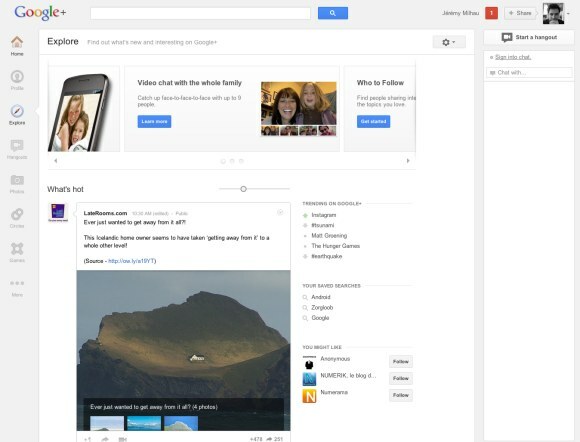 Google+ has a new interface that brings a lot of changes. It's not yet available to everyone and that's because it rolls out over the next few days. The new interface has a vertical navigation bar that lets you reorder and hide apps. When you mouse over an app, Google+ shows a list of quick actions. This change will make it easier to add third-party apps in the future. There are two new pages in the navigation bar: a hangouts page that lists the invitations from the people you've added to your circles, as well as a list of popular hangouts and an explore page for "what's hot". The list of circles is now displayed at the top of the page, the search box is larger and the chat gadget has been moved to the right sidebar. When you resize the window and there's not enough room to display the chat sidebar, it becomes a floating panel. Google+ conversations borrowed the old card interface from the previous versions of Gmail, while thumbnails for images and videos are bigger and include captions. The profile page now accommodates bigger photos, so it's probably a good idea to upload new photos. Vic Gundotra, Google Senior VP, says that there are 170 million Google+ users, up from 90 million users 2 months ago. That's a really impressive achievement. Beautiful. I love it. People, please switch. 170 million users? Yeah, because Google forces (more or less) every Youtube, Gmail, Picasa, etc user to opt in to Google+. But how many of those do really use it? How many of those are active users? Tons of my friends (300+) are on Facebook. Maybe 1-2 on Google+. You're an active user when you use any of Google's services. G+ isn't just a webpage in and of itself like FB - it's a common interface and social layer across all Google services. It's actually quite simple and elegant. I personally don't get why people are so hostile and resistant to it. I prefer the interface to FB, there isn't any ads on the G+ page and the content displays nicer. Also as someone else has already pointed out, Google is alot more up front and open than FB is to privacy issues. Just like it is possible to use Facebook just for the Talk instant messaging, it is possible to use G+ just for Picasa Web Albums. Google now treats all products as components of a single product, G+, for every new user. I use facebook just so I know everyone's birthdays but yet I still need a facebook account. Active user = USER! Active users are only people that visit their Google + (plus.google.com). You can use all the other services without even having a Google + account. And as others have said it is not about being better or worse than facebook. Google + has a ridiculously small amount of active users, its a fact. @Vlad I agree, people need to close their Facebook accounts and get on this. Google is much more respectful of your privacy and is on our side. I'm so glad it is taking off like this. I'm guessing this also has a lot to do with Google+ automatically being added with new Google accounts. Makes more sense to me. @John: there ae 800+ million YouTube users. That is a far shot from "every" user. Not all youtube users are Google+ users. You don't even have to own a Google+ account to use youtube. As many have already posted the actual number of people that use Google + is quite small. Did they get rid of the supremely annoying search bar that sticks at the top when you scroll down and is padded to three times the size of its contents? Just like every new google interface, the new g+ hate small screen. I find the new interface more complex and more crowded than before. They seem to have hidden features such as save searches, Google + most useful feature. The game page is worst than before, with new games hidden under directory making them even harder to find. The chat feature which was hidden and out of the way is now getting in the way and wasting screen space. The list of circles which was on the left hand side and made it easier to filter posts and switching between different circles is now hidden inside a drop down me (Along with save search feature apparently) The new way comments and posts are represented is horrible. The navigation menus take up even more space,. This is the first time I have stated this, but Google would better off going back to the old design and starting again. but i have go the new interface for Google plus interface. I think should not bring changes very fast Google+ and rather let it completely settle down. This update is terrible for my screen, I have so much wasted space and it looks awful, I mostly stare at a blank screen rather than the content I'm here to look at. Why are my circle posts squished to one side? My monitor size is not unusual. Looks like designed for iPad and later rolled to all others. I liked the new interface, but..
Why is the posting area so narrow? Aren't most people running wide screen monitors these days? Huge waste of space. This question has been raised and answered several times on several forums. I usually post a photo or any other interesting stuff in Facebook and keep the Facebook.com open on one of my tabs, checking it from time to time for any likes or comments. But When I post something in Google+, (I don't even visit the website much, but I share quite a lot of things there, much more than I don in FB) I just move on working with other Google products. Whenever I have a comment or a +1, I'm notified in all of the Google's services. Now, does that prove that I'm an active user of Facebook, but not G+?? Google is so innovative and competitive. Brilliant post. New Google Plus interface is not user friendly for me. Loved the new interface completely. Difficult for the first time users but gonna love it as they use it. For me, the biggest problem is that I have a vertical ribbon -- if there were an option to move it back tot he top, it would be great, but forcing a scroll to access a function is terrible design in my opinion. It's more looks over function. Also, I do wish that there was less white space everywhere -- it looks deserted and incomplete at best, and like it's for stupid people at worst. But my opinion as a user is worth what Google pays for it. To say the truth I'm shocked with that New interace of Google+. Now Google+ is becoming less useful for reading updates cause news column is thiner than it was before and there is actually blank column near (it contains some info at the top like "Trending" and "Invite friends" but why here?). By the way Google Buzz was much more useful for reading news but it was disabled. Before coming of Google+ the Google profile page was clean and contained profile information, i liked it. With coming of Google+ profile page became nobody knows what. The last updates of Google services (IGoogle, Gmail, Google Reader and others) in Google+ flavor seems to be not so successful. It is really annoying that we have no control to turn off this new sidebar and chat box!!! Please include a way to turn it off if we are not interested!!!! Why is there such HUGE blank space on the right side narrowing our reading area!? Please make it more customizable, at least making it possible to disable the HUGE empty right column!! I have to admit - I'm not sure what to make of Google+ yet. I think the idea behind it is really good - it's essentially taken what's great about Facebook and Twitter and merged them together to create a far more immersive interface. Google forgot to include photos from circles in the photo icon. I prefered the old interface. This is excellent!! 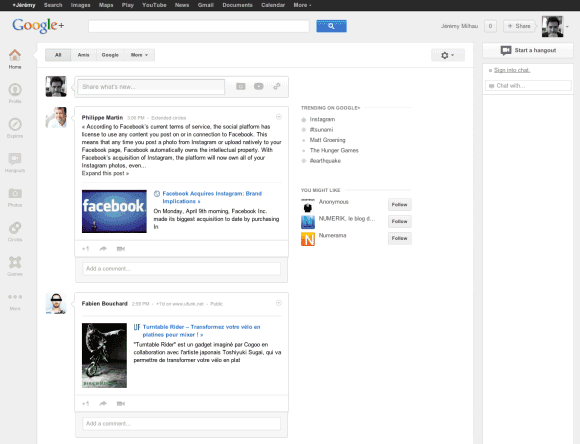 The new Google+ interference is much better than the new Facebook timeline that is nothing but confusing!! I like the clean and clear user interface of Google+, and I really hope that other social media sites will also try to keep their interfaces as clean as possible!! I find the new User Interface excellent. But what I find strange is that I can't scroll down on the page using either my mouse scroll wheel or my laptop's touch pad. Do some of you have the same problem like me? The new UI is excellent. But what I find strange is that I can't scroll down the page using either my mouse's scroll wheel or my laptop's touch pad. Do some of you have this problem like me?